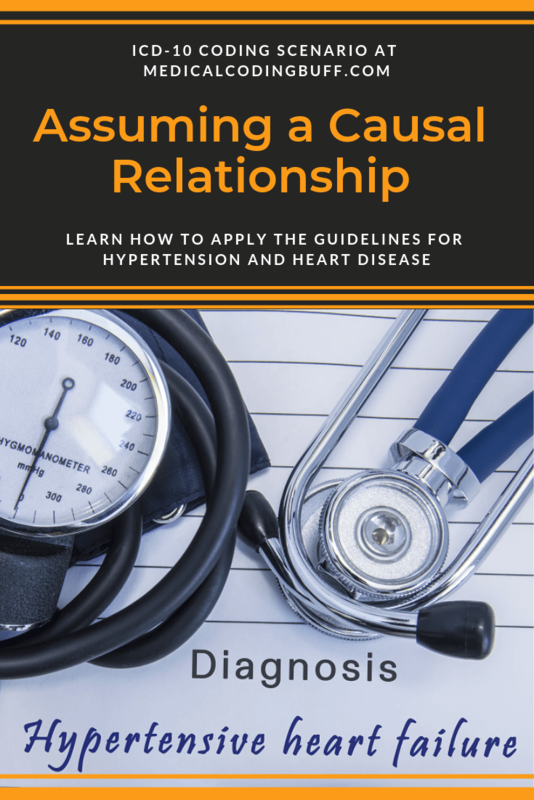 If you understand the coding guidelines involving causal relationships and the word “with” in the Alphabetic Index of the ICD-10-CM coding manual, making assumptions about hypertension and heart disease should not be difficult. Question: Patient has congestive heart failure due to hypertension. Assign the ICD-10-CM code(s). First of all, we need to know the coding guidelines related to hypertension and heart disease. Unless the documentation specifically states the conditions are not related. When looking up Hypertension in the Alphabetic Index, see Hypertension, heart, with heart failure (congestive) I11.0. In the Tabular, I11.0 refers to Hypertensive heart disease with heart failure. Synonym for Hypertensive heart disease is Hypertensive heart failure. We can go back to the Index and look up the code for congestive heart failure under Failure, heart, congestive (compensated (decompensated) I50.9. Just as the note stated under I11.0, the code for the type of heart failure is a I50.– code. In fact, it is I50.9. And In the Tabular, I50.9 refers to Heart failure, unspecified. According to the “Code First” note at I50, heart failure due to hypertension (I11.0) should be sequenced before I50.9 for congestive heart failure. Be sure to see the information above I10 that indicates for Hypertensive Diseases (I10-I16), we are to assign an additional code to identify tobacco use or dependence, exposure to, history of, or occupational exposure to tobacco. We cannot code for it here, because it wasn’t documented. Read all the Includes notes, as well as the Excludes1 and Excludes2 notes and apply when applicable.